EUGENE, O.R. -- In a showdown against preseason All-American Sabrina Ionescu, senior guard Cierra Dillard proved her spot amongst the best in the country on Sunday night as she finished off the Bulls tough 102-82 loss at #3 Oregon with a season-high and game-high 32 points while also dishing out five assists and grabbing four rebounds. Buffalo falls to 2-1 on the season while the Ducks improve to 4-0. Dillard led all scorers on Sunday night with a season-high 32 points while going 10-for-24 from the floor and 10-for-12 from the charity stripe as she went over the 20+ point plateau for the third straight game to open the season and the seventh straight game overall dating back to last season. Across her last seven games, Dillard is averaging 27.6 points and has netted 30+ points on two occasions. 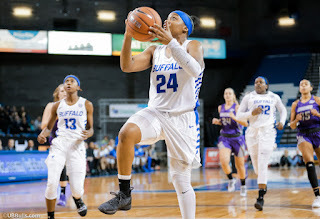 Senior forward Courtney Wilkins had another impressive game for UB as she finished with a season-high 19 points as she drilled a team-best five three pointers while freshman Keowa Walters played great off the bench as she netted a career-best 16 points and seven rebounds while going 7-for-10 from the floor in the loss. As a team, the Bulls were able to force 19 Oregon turnovers and they turned those into 24 points as Theresa Onwuka led the way with three of the Bulls' six steals on the day. The Ducks held the 35-23 edge in rebounds but the Bulls did outrebound Oregon 12-11 on the offensive glass and turned those chances into 12 second chance points. The difference in the game on Sunday night was the strong shooting by a potent Oregon offense as the Ducks were able to finish the game shooting 54.9% from the floor and 50.0% from behind the arc. The Ducks also went 34-for-38 from the charity stripe while the Bulls went 17-for-20 on their freebies. The Bulls were able to hang tight with the nationally ranked Oregon Ducks early on as Theresa Onwuka and Cierra Dillard both made free throws to give UB the early 4-2 lead. The Ducks then used a 8-0 run to take the 10-4 lead before Brittany Morrison drilled a jumper and Dillard sank a free throw after a technical foul on the Oregon head coach. A Courtney Wilkins triple cut the Ducks lead to 17-14 but the home team was able to close the quarter on a 7-0 run to take the 26-16 advantage through 10 minutes. Dillard decided to take over the scoring load for the Bulls early on in the second quarter as she was able to net seven of the first 10 points in the quarter as she capped that run with a three-pointer to cut the Oregon lead to 35-26 with just over four minutes left in the opening half. Freshman Keowa Walters entered the game off the bench late in the second quarter and netted six straight points for the Bulls before the Ducks extended their lead to 10, 44-34, as Yeager drilled a triple. Senior Autumn Jones then ignited a late run for the Bulls as she finished off a layup and drilled a deep triple to cut the Oregon lead down to 44-39 but the Ducks responded with a 5-0 run of their own to end the half and take the 49-39 lead into the locker room. The Buffalo defense was able to frustrate preseason All-American Sabrina Ionescu in the opening half as they forced her to turn the ball over a season-high six times through 20 minutes. Prior to Sunday night, Ionescu had only turned the ball over three times through three games. The #3 Ducks began to pull away from the Bulls in the third quarter as they used an early 9-0 run in the quarter to extend their lead out to 20, 61-41. Dillard and the Bulls wouldn't go away as the senior netted six points and Walters finished off a nice layup to cut the Oregon lead to 68-52 with just over three minutes left in the quarter. Wilkins then drilled back-to-back three pointers but the Ducks knocked down a triple at the buzzer to take the 80-60 lead into the final 10 minutes. The two sides played an even fourth quarter as both sides netted 22 points while the Ducks cruised to the 102-82 victory. Dillard led all UB scorers with eight points in the final quarter while Wilkins netted seven and Walters finished the fourth with six points as the Bulls strong effort came up just short against the #3 team in the nation. Sophomore Hanna Hall finished off her night with five points and tied a career-high with seven assists while Jones netted five points off the bench and Onwuka finished her game with three points and three steals. Ionescu finished off her 12th career triple-double on Sunday with 10 points, 10 rebounds and 10 assists while Ruthy Hebbard finished off the game with a team-high 25 points and eight rebounds. All five starters for the Ducks scored in double figures as they improved to 4-0 on the year. The Bulls will now head to Sin City for a pair of games in the South Point Thanksgiving Shootout. Buffalo will take on Georgetown on Friday, November 23 at 8:00 pm before wrapping up the tournament against South Dakota State on Saturday, November 24 at 8:00 pm.